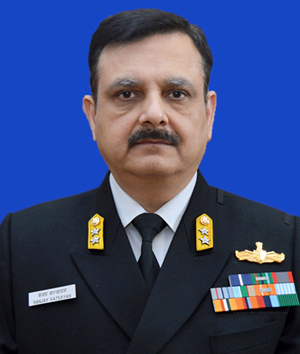 RAdm Sanjay Vatsayan, NM has taken over as the Assistant Chief of Naval Staff (Policy & Plans) at Integrated Headquarters Ministry of Defence (Navy) at New Delhi. He is a graduate of the National Defence Academy, Pune, India (1986), Defence Services Staff College, Wellington, India (2003), Naval War College, Mumbai, India (2010) and National Defence College, New Delhi (2014). He was commissioned into the Indian Navy on 01 Jan 1988 and specialised in Gunnery and missile systems in 1994. He has done his specialist tenures on frontline ships of the Indian Navy, including as the commissioning crew, INS Mysore and Coast Guard OPV CGS Sangram. He has also served as the Executive Officer of INS Mysore. His Command assignments include a Coast Guard IPV, Missile vessels INS Vibhuti and INS Nashak, missile corvette INS Kuthar and Guided Missile Frigate INS Sahyadri (commissioning crew). His staff assignments include Joint Director of Personnel, Director of Personnel (Policy), Director Naval Plans (Perspective Planning) and Principal Director Naval Plans.